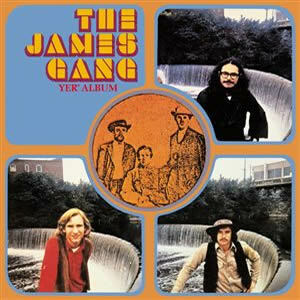 Yer Album is the debut album by James Gang, displays this power trio’s genius and raw power through the compositions but also shows their lack of recording experience due to the various filler throughout. Based in Cleveland, Ohio, it is clear that the group looked both to the East and the West for musical inspiration. This applies to their original compositions as well as the pair of covers. With a healthy dose of British heavy rock and California folk rock topping the trio’s Southern blues-flavored core, Yer Album is a celebration of all elements of the expanding world of rock and roll and the end of the sixties. James Gang drummer Jim Fox was a member of the band, The Outsiders, who had a national hit, “Time Won’t Let Me”, in the mid sixties. After leaving that group, Fox wanted to form a group oriented towards British rock. He recruited bassist Tom Kriss and a guitarist and keyboardist to form the original incarnation of the James Gang. After several lineup shuffles during the group’s first year, Fox was approached in 1968 by guitarist Joe Walsh who wanted to audition for the group. As the group narrowed from a five piece to a trio, Walsh assumed lead vocal duties and would eventually be their most identifiable member. ABC Records staff producer Bill Szymczyk was assigned to the group, a serendipitous move that began a long professional relationship between Szymczyk and Walsh. Szymczyk would go on to produce all three of the James Gang’s albums which Walsh played on as well as many of his solo albums through the 1970s and later albums by the pop group the Eagles, which Walsh joined in 1976. But long before the group was posthumously dubbed “Joe Walsh’s James Gang”, they were a legitimate power trio, with each given their own space to jam and demonstrate their musical chops. First the frivolous and annoying. In the grooves of the at the ends of each side of the original LPs were the infinite spoken messages, “Turn me over” and “Play me again”. Such antics also pertained to the opening tracks of each side. “Introduction” starts the first side with an improvised string quartet which cross-fades to a strummed acoustic riff which then roughly dissolves into the first proper song. It is a bit ironic that the first proper song by a group featuring a guitar legend like Joe Walsh is so keyboard dominated as “Take a Look Around”. The verses and chorus are dominated by an out-front organ and a piano holding the back end, all built on calm textures and acid rock ambiance. The song is strong on melody and mellow throughout with the middle section cut by a slow but piercing electric guitar lead, which returns again in the outro with a fuller arrangement. After this song is an odd, but interesting, section with competing spoken words and phrases. “Funk #48” contains the simplest of grooves and lyrics in the simplest of songs, albeit still very entertaining and a great contrast from the previous song. Szymczyk commented that the song started as a sound check warm-up riff but quickly developed into the funk/rock groove, driven by the rhythm section of Kriss and Fox. The second half of the first side contains a couple of extended renditions of contemporary covers. Starting with a grandiose intro of piano and strings and interrupted by wild guitar interludes, the group eventually kicks into a rock-oriented version of Buffalo Springfield’s “Bluebird”. After a few verses, the song slowly meanders into a middle jam with exquisite drumming by Fox and texture-based guitar phrases by Walsh. The Yardbirds’ “Lost Woman” provides an extended showcase for each musician, particularly bassist Tom Kriss, who starts his showcase with a hyper-riff on bass and provides, perhaps, one of the most extensive bass solos in rock history. Most of this nine minute is an extended jam where each member leaves it completely out on the floor, especially the rhythm players, as the entire jam is much more than self-indulgence, it builds in tension and intensity throughout. Side Two starts with more ambient noise, in the totally annoying “Stone Rap” before the beautiful, moody, and dark “Collage”, co-written by Patrick Cullie. This track could be the theme song for the entire album, as it truly is a collage of musical styles. The calmly strummed acoustic is accented by poignant but moody bass and strong drums and later some high strings and slight electric guitar join the mix. Overall, the tune is a real sonic treat and is original like no other. “I Don’t Have the Time” sounds (early) Deep Purple influenced as it is fast paced heavy rock, dominated by guitar overdubs and a furious drum beat, all while Walsh’s vocals carry an even keel, keeping the whole song grounded. The final filler piece, “Wrapcity in English” goes back to the piano and string quartet with a melancholy, minor note and not quite as frivolous as the rest of the filler on the album. “Fred” is one of the odder songs on this oddest of albums. The organ returns (although not as much presence as on “Take a Look Around”) and first two verses have long and deliberate vocal lines for a somewhat psychedelic effect. In contrast, the middle bridge features an upbeat jazz/rock section with harmonized guitars. The twelve minute “Stop” feels like the most natural song for the band on the album – a totally legitimate power trio jam, which seems like it will never actually “Stop”. A great track for jam-band enthusiasts, especially those who lean towards the heavy rock/blues side, the group provides a parting shot to show the great promise for the future. However, Yer Album would be the one and only album to feature these three together, as bassist Tom Kriss departed from the group by the end of 1969, making this a true capture of lightning in a bottle.